Signature? Doodle? Check How A Treasury Secretary Lew Might Sign Your Dollars : The Two-Way The man said to be President Obama's choice to be the next Treasury secretary has a very loopy, quite unusual signature. If he's confirmed, his John Hancock goes on U.S. currency. See what that might look like. Jacob "Jack" Lew's signature, on the 2012 "Mid-Session Review" of the federal budget. He was director of the Office of Management and Budget at the time. Treasury secretaries get to see their signatures on the nation's currency. 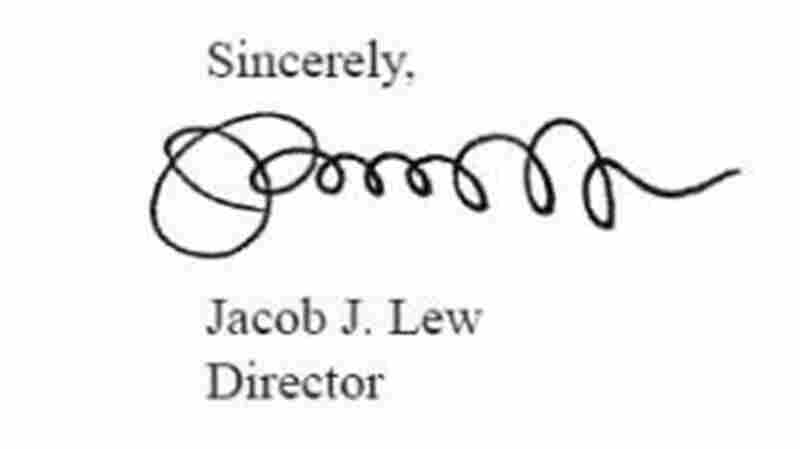 With word that President Obama wants to nominate his chief of staff, Jacob "Jack" Lew," to that post, lots of sites are taking a look at his rather unique signature. -- "Most ridiculous John Hancock ever?" (AOL.com). New York thinks Lew might try to "upgrade his penmanship" before submitting his official signature. It sounds like many might be disappointed if he does that. Want to see how Lew's signature compares to Treasury secretaries over the years (and to the nation's treasurers, who also get to have their names on paper currency, which was introduced in 1861)? There's a fairly complete list with images here. "After the dies are assembled and reproduced on plates, engravers cut in additional items, such as series, quadrant numbers, and signatures into the plates using a pantograph machine. A pantograph copies the die engraving onto the plate. As one part of the machine traces the original engraving another part engraves the image onto the new plate." Note: That's just a question, not a survey of public opinion or some sort of petition.